From Pont National in the 12/13th to Pont du Garigliano in the 15/16th there are 32 bridges over the Seine. Here they are listed as the river flows downstream. Where two bridges are listed at the same place the one on the south bank is listed first. 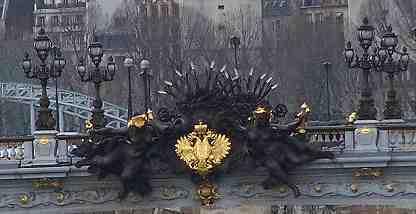 Pont Alexandre, above and below, is the most ornate bridge in Paris, and my favourite. It is constructed from steel and stone in the Art Nouveau style. It was opened by the last Russian Tzar, Nicholas II, who also laid the foundation stone, in 1900 to celebrate the Franco-Russian alliance. And it was named in memory of his father. It spans the Seine between the 7th and 8th arrondissements, from Invalides to avenue Winston Churchill, leading to the Champs-Elysées. This makes a truly great vista, and a marvellous walk in any weather. 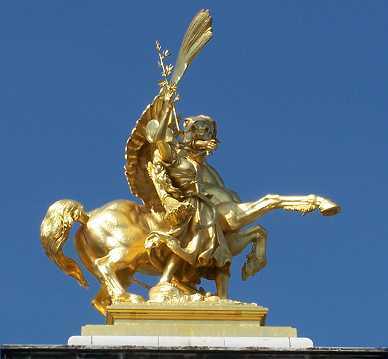 The photographs on the left were taken from Pont de la Concorde. Below you can see three of the the four pillars surmounted by magnificent gilded statues, and in the middle a close up of one of the statues just before a cloudburst. 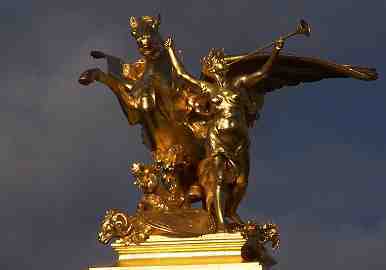 Below, the four gilt-topped pillars of the Pont Alexandre III, Paris' most ornate bridge, and my favourite. Taken from outside les Invalides. Pont du Carrousel on the left, crosses the Seine at the Louvre, and was built in 1833-4. Pont au Change, on the right, crosses the Seine from Chatelet to Ile de la Cité. It got its name because of all the business that was done on the old bridge on which goldsmiths and moneychangers built their shops and homes. The present bridge dates from 1859.